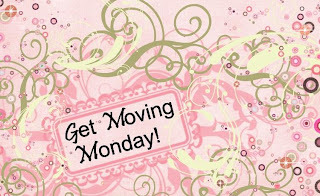 Get Moving Monday! is a place for you to check in and see how others are doing with their own healthy lifestyle goals. Let me know your successes and your failures, and even if you're already thin, share some tips with us, or just clue us in on how you do healthy. So welcome, and feel free to join the movement! Okay, I'm down a pound. Woot-Woot! I decided that I'm going to try for a pound a week. I know it sounds small, but baby steps people. I'm making a lifestyle change here. I also exercised this week. Not every day, I'm not there yet, but I'm making progress. This week, I will get in 5 full workouts. Okay, your turn! What change did you make this week?